Press-In-Place seals, including the Parker Diamond Seal™, are customized with self-retaining characteristics and are known for their excellent sealing properties. These innovative seals can be manufactured in most compounds and reduce housing machine costs with a particularly easy installation and rapid assembly. 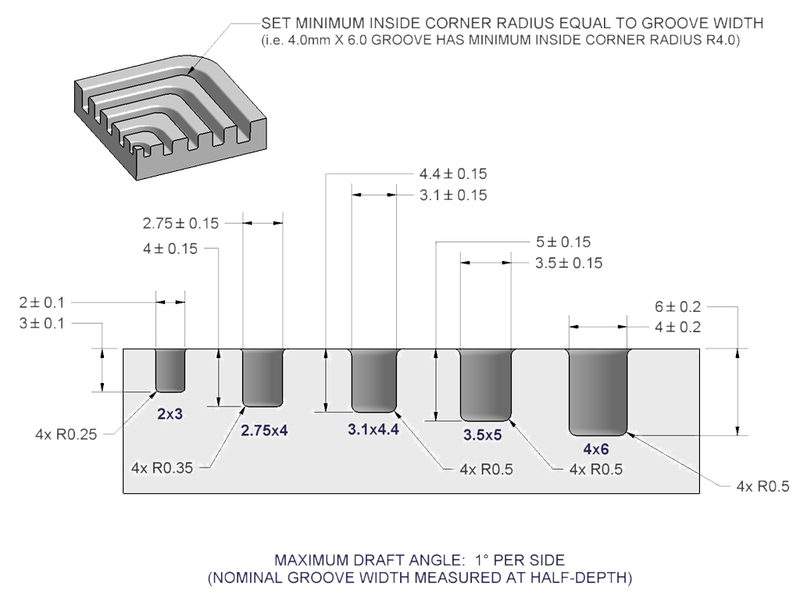 They are custom designed to fit into both standard and complex groove patterns, thus requiring minimum packaging space because the Press-in-Place Seals are molded to match typical groove layouts. Press-In-Place seals are characterized by many advantages, with notable sealing performance for electronic enclosures and consumer products. The Parker Diamond Seal™ achieves its optimal seal retention due to the use of innovative “press-in-place” design technology. Draft angle <1° per side. Surface finish: 63 µin (1.6µm) Ra typical. Machined, as-cast and molded grooves. Zatkoff's innovative sealing technology helps the Press-In-Place seals achieve optimal seal retention, thus eliminating seal-related warranty issues due to pinched or missing seals. Press-In-Place Seals also reduce housing machining costs, and offer a quick and easy installation. At Zatkoff Seals & Packings, we are committed to offering the best sealing solutions across applications. Our time-tested Press-In-Place seals include Parker’s patented Diamond Seal™ as part of that commitment to deliver exceptional products for the long term. Contact us to learn more about the benefits of our Press-In-Place Seals today. Given the technological advancements in recent years, many useful elastomers, or polymers, have since been developed that satisfy even higher operating conditions. Today’s O-ring compounds offer better chemical and physical properties, allowing them to withstand higher pressures and higher temperatures, with incredible resistance to numerous fluids.